My Take on it – I didn’t know what to expect with this movie and was pleasantly surprised that it wasn’t a rom-com but actually a music related drama that worked very well. First and foremost, the music is amazing and helps set a tone for a very satisfying and entertaining film. The soundtrack really works well, but the Oscar nominated song “Lost Stars” is the best among them all. The casting of Mark Ruffalo and Keira Knightley was a smart one because I never would have guessed that they would work so well together. Their characters are so diverse, but their love of music brings them together to try and break the mold of what we would expect from music and the music industry. The characters are developed well and are interesting enough for us to want to spend nearly two hours watching them thru their ups and downs; triumphs and failures. Overall, this movie has a very interesting message for us to all take away regarding the endless possibilities of second chances. All we have to do is pick ourselves up and move forward and it could happen. But if we stay put and don’t try, nothing can help us make changes. Bottom Line – Such a pleasure to watch this film. The music is great, the characters are interesting and well developed and the message is clear. Recommended! It’s corny, but the songs are emotional enough that they actually worked for me. Good review. Interesting review, will definitely consider watching this one. Once is so much better i was let down by this. 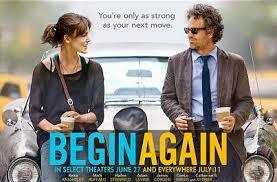 I thought the whole conceit of recording in the city was silly and Kiera Knightley’s character annoying. The way she kept acting like making money from music was a crime.